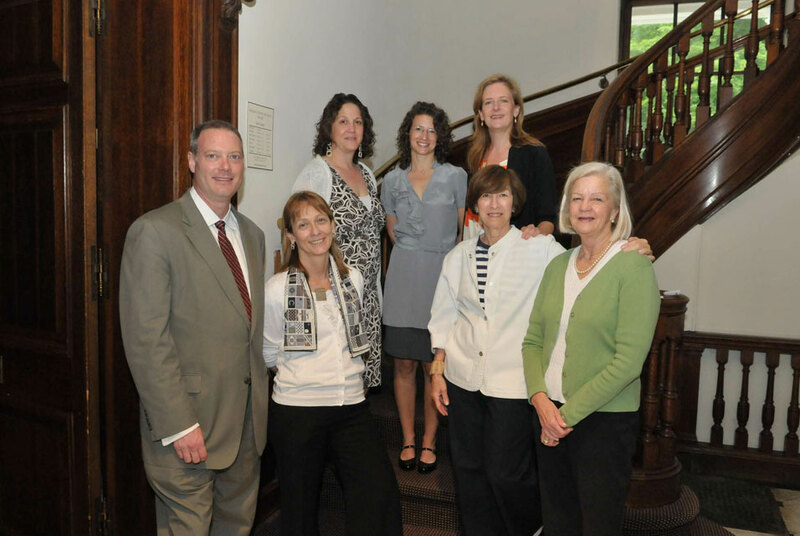 Left to right: Karl Emil Willers, Ph.D., director of Nassau County Museum of Art; Patricia Lannes, director of education for Nassau County Museum of Art; Margot Edlin, Ed.D., assistant professor of basic educational skills at Queensborough; Jean Henning, senior museum educator of Nassau County Museum of Art; Amy Chase Gulden, regional director of Visual Understanding in Education for New York; Kitty Bateman, J.D., associate professor of basic educational skills at Queensborough and chapter chair of the Professional Staff Congress/CUNY; Rebecca Hirschwerk, museum educator for Nassau County Museum of Art. ROSLYN HARBOR, NY.- Over the past year, educators at Nassau County Museum of Art (NCMA) and Queensborough Community College (QCC) have been developing strategies that use the visual arts to assist non-English speaking adults achieve English literacy. The result, the CALTA (Culture and Literacy through Art) Institute, was launched at a four-day workshop held at the museum from June 14-17, 2010. The American Association of Museums (AAM) says that this program positions NCMA as a key player in helping ease the transition of new immigrants into their American communities. The NCMA/QCC collaboration is one of only a handful of initiatives nationwide cited by AAM. According to the AAM report, CALTA offers English language learners a means of finding a voice in a new culture and, for some, new modes of critical expression. This program has been made possible through a grant from the Institute for Museums and Library Services (IMLS). Methodologies for learning in this new program are based on VTS© (Visual Thinking Strategies). Amy Chase Gulden, regional director of VUE (Visual Understanding in Education) for New York, explained to workshop participants that VTS is a non-judgmental discussion- based experience in which there are no right or wrong answers. Participants are asked to respond to a work of art by discussing what they see and what is going on in the picture. To learn more about CALTA, please visit www.cultureandliteracy.org.